Eleven years ago — when I first moved here, I worked for a medium-sized software company in Cambridge . Times were good… the Internet bubble had not yet burst and there was plenty of money for extracurricular activities — paid for by the office. The first restaurant I ate at upon arriving, was Dali’s in Cambridge. My manager took us there for a departmental dinner one night and I was completely enamored. The racy decor (I haven’t been in a while, but back then there were red bras, lingerie and other unmentionables streamed across the ceiling from chandelier to chandelier), my first experience with tapas, the sangria, the flan, the jovial atmosphere, you name it. It became an instant favorite. As I became more familiar with both the “Cambridge side” and the “Boston side” of the river, I stumbled upon Tapeo on Newbury Street in Back Bay. Same menu as Dali’s, same vibe as Dali’s, similar decor… what gives? Upon a little research, I discovered that the restaurants are family owned… though not jointly. 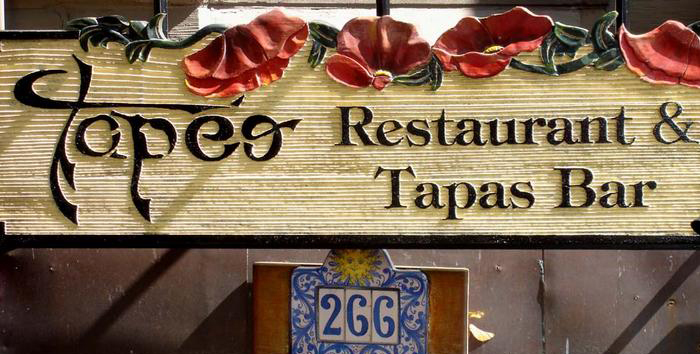 If the Internet data is true, Tapeo’s is run by the son of Dali’s owners. While I definitely prefer Dali’s, because it was my first real tapas experience and the decor can’t be beat, Tapeo’s is much easier for us now due to where we live. When we lived in Back Bay, we would frequent Tapeo’s, sitting on the patio outside in the warmer months and snuggling up to the bar for a glass of Spanish red in the cooler months. In fact, I specifically remember a night when the Husband and I first started dating that he spilled a glass of RED WINE on my cream colored pants. A lot of wine. But we won’t go there… I married him anyway after all. So when we had finally booked a LONG OVERDUE Date Night two Friday’s ago and it was one of those cloudless, warm and beautiful days — the obvious choice “for old time’s sake” was Tapeo. We drove into the city, hit ridiculous red sox and “good weather traffic” and by the time we finally made it onto Newbury Street, it was already 7pm. We were certain we would NEVER get an outside table… but as luck had it, we were seated immediately. The very first thing I noticed was that obviously the economy has hit Tapeo where it hurts. The prices seemed very inflated to me and much higher than they had been for out last visit… which couldn’t have been more than a year or so back. The patio was full, but there was only ONE waiter working the entire 15 or so tables. It took a good 10 minutes to get our water, another 7 or 8 minutes to place our drink order (the server refused to take our food order at that time… even though we were ready… b/c he was “too busy”) and then another 10 or so minutes for our food order. Once everything was ordered, the food arrived at the same pace it generally does. For drinks, we had cocktails. I had a Caipirinha (my favorite), which was served with your choice of mango, kiwi, papaya or blood orange puree/juice. I went with the kiwi puree and it was a perfect combination. If I remember correctly, the Husband had a twist on a Manhattan — the twist was that it was served with blood orange and blood orange bitters. It was VERY strong. And then one special. I don’t remember what it was called in Spanish, but it was breaded and fried zucchini slices, stuffed with Manchego cheese and some type of Spanish ham. The husband picked the ham off of a slice so I could try it and it was quite good. All the dishes were actually good… exactly as we expected. We tend to get the sizzling garlic shrimp and the baked goat cheese EVERY TIME we visit, so we know what to expect. It was just the price that was killer. When I go to a tapas place — where the portions are much smaller than a traditional appetizer — I don’t expect to pay appetizer prices. I feel like the prices at Tapeo used to be more in the $6 and $7 dollar range and now nothing on the menu is that price. The cheapest items are $8 and are purely vegetarian. What gives??? In any case, we had a nice return to Date Night and enjoyed the fresh air and our first meal outside of the season. I’m not sure that we’ll go back to Tapeo’s any time soon though. It was always the place we went to when we wanted cheap, good/decent food. Now it’s expensive food… and is still only decent for what it costs. Kind of disappointing.